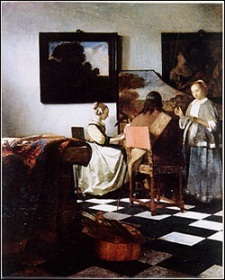 The Concert, by Vermeer, one of the works stolen from the Isabella Stewart Gardner museum on this day in 1990. 1990: The Isabella Stewart Gardner Museum (Boston) is robbed by two men dressed as police officers, who gain entrance to the museum by advising on-duty security personnel that they are responding to a call of a disturbance within the compound. The thieves get away with a dozen pieces of artwork—including paintings by Vermeer, Rembrandt, Manet, and five works by Degas—worth hundreds of millions of dollars. To this day, the case remains unsolved and the art remains missing. 1981: The Buffalo Sabres set an NHL record by scoring nine goals in one period against the Toronto Maple Leafs. 1967: In the world’s first major oil spill, the 974-foot supertanker Torrey Canyon strikes Pollard’s Rock in the Seven Stones reef between Land’s End and the Scilly Isles, and subsequently leaks 31 million gallons of crude, leaving a slick 35 miles wide and up to 20 miles long. The oil fouls the shores of the south coast of England and the Normandy coast of France, laying waste to the sea biology of the region. The disaster is later attributed to a combination of factors, including the Captain’s decision to take a short-cut, a navigational mistake by the Junior Officer, and the limited maneuverability of the ship. 1925: The so-called Tri-State Tornado cuts a 219-mile path through Missouri, Illinois and Indiana, killing at least 695 people—including 234 in Murphysboro, Illinois—making this the deadliest tornado in U.S. history.